Objectives To estimate the rates of maternal-fetal transmission of Zika virus, adverse fetal/neonatal outcomes, and subsequent rates of asymptomatic/symptomatic congenital Zika virus infections up to the first week of life. Design Cohort study with prospective data collection and subsequent review of fetal/neonatal outcomes. Settings Referral centre for prenatal diagnosis of the French Guiana Western Hospital. Participants Pregnant women at any stage of pregnancy with a laboratory confirmed symptomatic or asymptomatic Zika virus infection during the epidemic period in western French Guiana. The cohort enrolled 300 participants and prospectively followed their 305 fetuses/newborns. 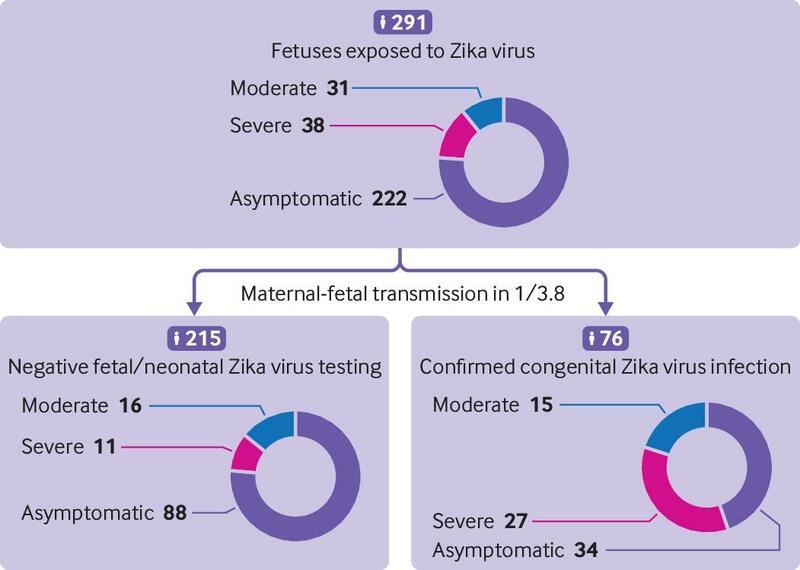 Main outcome measures Rate of maternal-fetal transmission of Zika virus (amniotic fluid, fetal and neonatal blood, urine, cerebrospinal fluid, and placentas); clinical, biological, and radiological outcomes (blindly reviewed); and adverse outcomes defined as moderate signs potentially related to congenital Zika syndrome (CZS), severe complications compatible with CZS, or fetal loss. Associations between a laboratory confirmed congenital Zika virus infection and adverse fetal/neonatal outcomes were evaluated. Results Maternal-fetal transmission was documented in 26% (76/291) of fetuses/newborns with complete data. Among the Zika virus positive fetuses/newborns, 45% (34/76) presented with no signs/complications at birth, 20% (15/76) with moderate signs potentially related to CZS, 21% (16/76) with severe complications compatible with CZS, and 14% (11/76) with fetal loss. Compared with the Zika virus positive fetuses/neonates, those that were identified as negative for Zika virus (215/291) were less likely to present with severe complications (5%; 10/215) or fetal loss (0.5%; 1/215; relative risk 6.9, 95% confidence interval 3.6 to 13.3). Association between a positive Zika virus test and any adverse fetal/neonatal outcome was also significant (relative risk 4.4, 2.9 to 6.6). The population attributable fraction estimates that a confirmed congenital Zika virus infection contributes to 47% of adverse outcomes and 61% of severe adverse outcomes observed. Conclusion In cases of a known maternal Zika virus infection, approximately a quarter of fetuses will become congenitally infected, of which a third will have severe complications at birth or fetal loss. The burden of CZS might be lower than initially described in South America and may not differ from other congenital infections. The recent epidemics in French Polynesia and the Americas have confirmed vertical trans-placental transmission of Zika virus and its association with congenital anomalies, particularly severe central nervous system lesions.123 Nevertheless, the exact burden of disease remains unclear, especially in endemic countries. Similarly to congenital cytomegalovirus and toxoplasmosis infections, vertical transmission is not systematic and does not always lead to fetuses/infants with apparent signs of infection.4 The risk of congenital Zika virus syndrome (CZS) was estimated, at first, to be higher than 40% in a cohort of women who developed symptomatic Zika virus infection during pregnancy in Brazil,5 whereas more recent data from the US Zika pregnancy registry suggest an overall risk of 5% and up to 8% in cases of maternal infection in the first trimester.6 The lack of fetal/neonatal testing in previous studies has impaired accurate estimations of maternal-fetal transmission and risk of symptomatic congenital infection. We conducted a cohort study among pregnant women in western French Guiana during the recent Zika virus epidemic and evaluated the results of comprehensive fetal/neonatal testing for Zika virus. Our primary objective was to estimate the absolute risk of maternal-fetal infection. The secondary objectives were to estimate the percentage of fetuses/newborns with overt signs of infection or related complications within the first week of life, by reviewing fetal/neonatal outcomes blinded to Zika virus status; to estimate the relative risk of adverse perinatal outcomes in infected fetuses; and to estimate the population attributable fraction of a confirmed congenital Zika virus infection for any adverse outcome and for severe adverse outcomes. The CHOG is located in the western part of French Guiana, in Saint Laurent du Maroni. With a total of 284 beds, it is the second largest hospital in French Guiana and includes a maternity unit providing neonatal intensive care. The catchment population of the CHOG is quite similar of that of all French Guiana, but some particularities come from the fact that a part of the western population live along the Maroni river and are more exposed to poverty, difficult living conditions, and subsequent medical comorbidities (higher rates of pregnancy among adolescents and higher risks of prematurity, vascular diseases, lead poisoning, and anaemia). We identified patients for inclusion in the study either through routine serological testing of all pregnant women admitted to the prenatal unit of the CHOG (irrespective of the trimester of pregnancy or presence of symptoms) or through serological and molecular testing of pregnant women with Zika virus symptoms admitted in our department (fig 1). We included patients with a confirmed Zika virus infection during pregnancy from 1 January to 15 July 2016.811 The enrolment period thus occurred in the early stages of the Zika virus epidemic in French Guiana. We excluded patients not monitored in our prenatal diagnosis unit after the diagnosis of Zika virus infection owing to the lack of prenatal follow-up, patients with fetal losses before 14 weeks’ gestation, and patients for whom the diagnosis of Zika virus infection was based on serology performed at delivery. We excluded the last group because of the lack of prospective follow-up during pregnancy and comprehensive fetal/neonatal assessment during the first week of life, as Zika virus status was available only after discharge from hospital (at the peak of the epidemic, results were delayed by as much as two weeks owing to limited technical and human resources). Patients included in the study provided written informed consent after discussing the objectives of the study. We collected data on demographic characteristics, medical parameters, and possible risk factors for congenital diseases.11 Pregnancies were monitored as clinically indicated, except for the addition of prenatal ultrasound scans performed monthly during the Zika virus epidemic as recommended by the French authorities. In France, prenatal screening for aneuploidy, HIV, toxoplasmosis, rubella, and syphilis are offered to all pregnant patients during the first trimester. Screening for cytomegalovirus, herpes simplex viruses, and parvovirus B19 (TORCH screening) is proposed in cases of suspected maternal/fetal infection. Gestational age was based on the crown-rump length on an ultrasound scan performed between 11 and 13+6 weeks’ gestation. Prenatal care as outlined above was supported by the French maternity insurance available to all pregnant women, regardless of their socioeconomic conditions. We defined a confirmed congenital Zika virus infection either by Zika virus RNA amplification by RT-PCR from at least one fetal/neonatal sample (placenta, amniotic fluid, cerebrospinal fluid, urine, or blood) or identification of Zika virus specific IgM in the umbilical cord/neonatal blood or in cerebrospinal fluid. Zika virus status was confirmed at day three of life by IgM serology to exclude maternal contamination of umbilical cord blood in all liveborn neonates (except in four neonates whose parents declined). In cases of fetal loss, blood status was defined only by umbilical cord samples. We followed fetuses/newborns from mothers positive for Zika virus up to their first week of life and collected data as well as results of neonatal/fetal testing. When a fetal malformation was suspected, invasive testing was offered to complete TORCH PCRs, karyotype, and comparative genomic hybridisation array if necessary, after discussion with an expert fetal multidisciplinary centre (Caen University Hospital, France), according to French legislation. All fetuses underwent haematological and biochemical screening at birth, performed on cord and/or neonatal blood before the third day of life. Pregnant women had monthly ultrasound examinations from the time of diagnosis of Zika virus infection until delivery, with standardised biometric measurements and anatomical evaluation, paying special attention to the brain anatomy, as recommend by national and international medical societies.1314 All fetal ultrasound examinations were performed by two experienced sonographers (VL, LP) using E8 and E10 Voluson ultrasounds with abdominal (RM6C) and transvaginal (RIC5-9-D) transducers (General Electric Medical System, Milwaukee, USA). A transfontanellar ultrasound scan was offered for all neonates during the first week of life, using Phillips EPIQ 7g ultrasound with a neonatal cephalic (C8-5) transducer (Phillips Medical Systems, Cleveland, USA). Computed tomography scanning was not offered routinely owing to the limited capacity of the local radiology unit and was done only if calcifications or skull abnormality were suspected (on prenatal or postnatal ultrasound scans or clinical assessment for skull abnormalities). The radiology unit did not offer magnetic resonance imaging, and the nearest scanner was located 300 km away. Because of these limitations, computed tomography and magnetic resonance imaging examinations were performed after the first week of life and data are not reported in this study. All neonates underwent clinical examination at birth by a midwife and at day three of life by a senior neonatologist. A complete physical examination was performed with special attention to anthropometric measurements, neurological status, and signs of infection, as recommended by international medical societies.15 Anthropometric measurements were assessed according to the Intergrowth charts available at https://intergrowth21.tghn.org/standards-tools/. On the basis of previously published criteria to define congenital Zika virus and cytomegalovirus infections,16171819 we used minor and major signs to define four categories (appendix 1). (1) Asymptomatic was defined as no major signs and less than two minor signs. (2) Mild/moderate signs potentially associated with CZS were defined as no major signs and at least two minor signs. (3) Severe complications compatible with CZS were defined as one major sign or three minor signs including at least one cerebral anomaly identified on prenatal or postnatal ultrasound. (4) Fetal loss was defined as the spontaneous demise of the fetus after 14 weeks’ gestation. Fetal loss includes late miscarriages (14-24 weeks)20 and stillbirths (fetal demise >24 weeks) but not intrapartum nor early postpartum deaths.21 We defined “any adverse outcomes” as mild/moderate signs potentially associated with CZS or severe complications compatible with CZS or fetal loss (2+3+4) and “severe adverse outcomes” as severe complications compatible with CZS or fetal loss (3+4). Three independent reviewers (LP, MV, DB) blinded to Zika virus status reviewed all fetal/neonatal outcomes and classified them into the four categories described above on the basis of prenatal/transfontanellar ultrasound findings, symptoms at birth, and haematological and biochemical blood analyses (appendix 1). Discrepant cases were discussed between reviewers to determine the most appropriate classification. We compared the demographic and clinical variables of Zika virus positive and negative fetuses/newborns. We used the binomial Wilson score to calculate confidence intervals of single proportions and the Pearson exact method to calculate confidence intervals of risk ratios and medians. We present denominators where data for the secondary outcome are missing. We defined the population attributable fraction as (Re–Run)/Re=(RR–1)/RR, calculated using Stata. To test the robustness of our findings, we did a sensitivity analysis. As the placenta might be contaminated by maternal blood, we redefined the criteria for a laboratory confirmed congenital Zika virus infection to exclude placentas and removed them from the analysis. We used Stata 14 for data analyses. This research was done without patient involvement. Patients were not invited to comment on the study design and were not consulted to develop patient relevant outcomes or interpret the results. Patients were not invited to contribute to the writing or editing of this document for readability or accuracy. We have invited the public to help us to develop our dissemination strategy. From 1 January to 15 July 2016, 300 pregnant women with a positive Zika virus test, of whom 52 (17.3%) presented with compatible symptoms, were monitored in the prenatal diagnosis unit of the CHOG and included in the study, representing a total of 305 exposed fetuses (including five twin pregnancies). Zika virus testing was available for 291 fetuses/newborns and clinical outcomes for 300 fetuses/newborns (fig 1). Maternal-fetal transmission was documented in 76/291 (26%, 95% confidence interval 21% to 32%) of fetuses/newborns with complete data. Positive Zika virus results were obtained from 48/280 (17%) umbilical/neonatal cord blood samples (confirmed at day three of life for liveborn neonates), 51/232 (22%) placentas, 7/247 (3%) urine samples, 5/12 (42%) amniotic fluid samples, and 4/7 (57%) cerebrospinal fluid samples. When we excluded placental samples from the analysis, maternal-fetal transmission was documented in 52/282 (18%, 14% to 23%) fetuses/newborns with other samples tested. Among fetuses/newborns with negative testing, 4/215 (2%) had four different samples tested, 167/215 (78%) had three different samples tested, 36/215 (17%) had two different samples tested, and 8/215 (4%) had only one sample tested. Among fetuses/newborns with a laboratory confirmed Zika virus infection, 1/76 (1%) had five different samples tested, 3/76 (4%) had four different samples tested, 38/76 (50%) had three different samples tested, 15/76 (20%) had two different samples tested, and 19/76 (25%) had only one sample tested (appendix 2). As shown in table 1, no significant differences in baseline maternal characteristics existed between the two groups. We also observed similar baseline maternal characteristics between patients included in and excluded from the cohort, as well as in all patients delivered at CHOG during 2016 (appendix 3). Cases of maternal co-infection among fetuses/neonates with a laboratory confirmed Zika virus infection included two active hepatitis B infections. In fetuses with a negative Zika virus test, two HIV, two primary toxoplasmosis, one human T-lymphotropic virus, one Coxsackie virus, one primary varicella zoster virus, and one leptospirosis were recorded. The timing of diagnosis of maternal infection was similar between fetuses/newborns with a confirmed Zika virus infection and those with no laboratory evidence of a Zika virus infection. Among exposed fetuses (n=291), 210 (72%, 67% to 77%) presented with no signs/complications at birth, 31 (11%, 8% to 15%) presented with mild/moderate signs potentially related to CZS, 26 (9%, 6% to 13%) presented with severe complications compatible with CZS (including three medical termination of pregnancy), and 12 (4%, 2% to 7%) fetal losses were recorded (fig 2). Among the 76 fetuses/neonates with a documented congenital Zika virus infection, 34 (45%, 34% to 56%) presented with no signs/complications, 15 (20%, 12% to 30%) had mild/moderate signs, 16 (21%, 13% to 33%) had severe complications, and 11 (14%, 8% to 24%) resulted in fetal loss (table 2). In contrast, among the 215 fetuses/neonates that tested negative for Zika virus, 188 (87%, 82% to 91%) presented with no signs/complications, 16 (7%, 5% to 12%) had mild/moderate signs, 10 (5%, 3% to 8%) had severe complications, and 1 (0.5%, 0.1% to 3%) resulted in fetal loss (table 2). A full description of each fetus/newborn with an adverse outcome is available in appendix 4. Fetuses/newborns with a laboratory confirmed congenital Zika virus infection had a higher risk of “any adverse outcome” (that is, mild/moderate signs or severe complications or fetal loss) (42/76; 55% (44% to 66%) versus 27/215; 13% (9% to 18%)) than did those who were considered Zika virus negative by laboratory testing (relative risk 4.4, 95% confidence interval 2.9 to 6.6). Similarly, the risk of “severe adverse outcomes” (defined as severe complications or fetal loss) was higher in cases of confirmed congenital Zika virus infection (relative risk 6.9, 3.6 to 13.3). The population attributable fraction of a confirmed congenital Zika virus infection was 47% for any adverse outcome and 61% for severe adverse outcomes. When we did our analysis using a more restrictive definition for a confirmed congenital Zika virus infection (that is, sensitivity analysis by excluding placental Zika virus samples owing to potential maternal contamination), the results were similar to those of the main analysis for “any adverse outcomes” (relative risk 4.2, 2.7 to 6.0) and “severe adverse outcome” (5.4, 2.8 to 10.2). On examination of individual symptoms (table 3), fetuses/newborns with a laboratory confirmed congenital Zika virus infection presented with more frequent jaundice (19/76 (25%) v 20/215 (9%)), hypotonia (10/76 (13%) v 11/215 (5%)), hypertonia (5/76 (7%) v 3/215 (1%)), and swallowing dysfunction (4/76 (5%) v 1/215 (0.5%)) than did those that tested negative for Zika virus. In newborns with measurements available, head circumference below 2 standard deviations (that is, microcephaly) was observed in 10% (27/273) of newborns and four newborns presented with a head circumference below 3 standard deviations. The rate of microcephaly was similar between fetuses/neonates with a laboratory confirmed congenital Zika virus infection and those who tested negative (8/61 (13%) v 19/212 (9%) for head circumference <2 SD). Biological parameters measured in newborns with a laboratory confirmed congenital Zika virus infection (table 3) identified an increased incidence of anaemia (17/57 (30%) v 8/192 (4%) for haemoglobin <140 g/L) and elevated liver enzymes (32/52 (62%) v 40/155 (26%) for aspartate aminotransferase >50 U/L). Other biological parameters, such as thrombocytopenia often associated with other congenital infections, did not differ between the groups. In our cohort, only 13% (approximately one in eight) of all fetuses/newborns born to mothers positive for Zika virus presented with “severe adverse outcomes.” This is comparable to rates for other congenital infections, such as congenital cytomegalovirus. Maternal-fetal transmission rates of congenital cytomegalovirus are estimated to be 30-35% in cases of maternal primary infection. Among fetuses infected with cytomegalovirus, only 10-15% are estimated to present without signs/complications at birth.22 This rate can be up to 30% when considering all observed anomalies and related terminations of pregnancy.23 Our large cohort study with complete and comprehensive analysis of early neonatal outcomes including neonatal test results facilitates a well informed estimate of the burden of disease in countries with active Zika virus circulation. Although large cohort studies have described neonatal outcomes,5 including the recent report from the US Zika pregnancy and infants registry encompassing 2464 infants and the Zika-DFA study including 555 fetuses, the results of laboratory testing were not described.624 Our results are congruent with another recent study performed in Brazil among 54 pregnant women with RT-PCR confirmed Zika virus infections, in which vertical transmission was documented in 18/51 (35%) newborns tested, whereas 15 (28%) newborns had mild/moderate signs. These included isolated ultrasound anomalies such as lenticulostriate vasculopathy or subependymal cysts, abnormal otoacoustic emissions, chorioretinitis, and intrauterine growth restriction; severe anomalies were not described.25 The broader number of patients included in our cohort may have enabled the detection of more uncommon severe anomalies and provided a better estimation of maternal-fetal transmission. The rates of severe anomalies (9%) and pregnancy losses (4%) in our whole cohort of exposed pregnancies are similar to those reported in non-endemic countries; the US Zika pregnancy and infant registry describes rates of 5% for severe anomalies and 3% for pregnancy loss in exposed pregnancies.6 Our results are concordant with the recent Zika-DFA study performed in a similar population, in which neurological defects and fetal losses were reported in 7% and 1% of 555 exposed fetuses, respectively (compared with 9% and 4% in our study).24 Our study also considered clinical and biological aspects up to the first week of life, which may have increased the rate of severe outcomes. In our study, the most common clinical symptom reported was jaundice, and neonates with a laboratory confirmed Zika virus infection had a moderate elevation of aspartate aminotransferase. Although it was initially believed that Zika virus is not associated with systemic manifestations, mild anaemia, cholestasis, and a moderate elevation of aspartate aminotransferase have been previously described in infected fetuses.26 Furthermore, a transient hepatitis, with spontaneous resolution at 4 months of age, has been described in a peripartum infected newborn in French Polynesia.27 This suggests that transient liver damage might be part of a moderate CZS, similarly to what is known for congenital cytomegalovirus.17 We observed more frequent neurological impairment (hypotonia, hypertonia, and swallowing dysfunction) among fetuses/newborns with a laboratory confirmed congenital Zika virus infection than in those that tested negative. Brainstem dysfunction, manifested by absence of sucking and swallowing, have also been described by others,28 even in newborns without microcephaly or severe cerebral radiological anomalies.29 Thus, newborns from mothers exposed to Zika virus during their pregnancy should be systematically screened for dysphagia and other subtle neurological impairments, even in the absence of neuroimaging findings. Our study has several limitations. First of all, information about the sensitivity and specificity of neonatal testing is limited.1 In particular, several studies have shown the progressive disappearance of Zika virus RNA in the maternal-fetal compartments (fetal and maternal blood, amniotic fluid, and neonatal blood and urine).2630 In contrast to cytomegalovirus, which may be detected for several months in the urine of congenitally infected newborns, Zika virus RNA was rarely detected in urine samples (7/76; 9%). Although the sensitivity of amniocentesis seems to be limited in cases of congenital Zika virus infection,26 it may help to diagnose early fetal infections but was only performed in 12 cases when prenatal ultrasound scans were suggestive of congenital infection. In that context, we cannot exclude false negative results. Of note, severe complications compatible with CZS were observed in 10 (5%) newborns without laboratory evidence of Zika virus infection; either we were not able to detect Zika virus in these cases or other aetiologies may have induced similar complications (the rate of brain anomalies in the general population is estimated to be 3%).31 The high number of fetuses/neonates with negative results that underwent multiple Zika virus neonatal tests (80% (171/215) had at least three different samples tested) ensures a low probability of false negative results. Furthermore, we considered placental and umbilical cord samples in the diagnosis of congenital Zika virus infection, which may be questionable owing to the risk of maternal contamination of these samples.15 Nevertheless, the risk of false positive results due to maternal contamination seems to be low in this study. Zika virus status based on umbilical cord blood samples was confirmed at day three of life in all but four neonates. Additionally, we previously detected Zika virus RNA and specific IgM in placental and fetal umbilical cord samples in seven of eight cases with a laboratory confirmed congenital Zika virus infection, even when maternal blood and urine were negative.26 When we excluded placental samples from our analysis, maternal-fetal transmission was documented in 18% (52/282) cases, of which 33% (17/52) had severe complications at birth. Association between a laboratory confirmation of congenital Zika virus infection and outcomes did not change in our sensitivity analysis. Secondly, our study focuses on immediate neonatal outcomes. In congenital cytomegalovirus, as many as 13.5% of newborns who present with no signs/complications at birth will subsequently develop permanent sequelae, such as motor, cognitive, or vision impairment and sensorineural hearing loss.32 Study of developmental milestones and visual and auditory capacity in exposed fetuses will be important. These might be difficult to monitor owing to the lack of follow-up, particularly in newborns with no symptoms. Furthermore, our postnatal radiological analysis was based on transfontanellar ultrasound scans, for which the sensitivity for central nervous system anomalies is lower than for magnetic resonance imaging or computed tomography scanning for calcifications and skull anomalies. The closest magnetic resonance imaging scanner was located 300 km away and was therefore not available for this study. Similarly, computed tomography scanning was not routinely available owing to the limited resources of our radiological unit. When performed, it was often done after the first week of life and therefore not included here. We cannot exclude the possibility that some mild anomalies were not identified. In this study, nine newborns with severe complications had no anomalies identified on prenatal ultrasound scans. Overall, we recognise that several authors have proposed a broader definition of CZS,3334 based on both advanced techniques (magnetic resonance imaging, computed tomography scanning) and specialised evaluation (ophthalmologist, infectious diseases specialist, and neurologist specialised in paediatrics). Such evaluations are not routinely available in French Guiana, explaining why fundoscopy and results of auditory testing are not described in this paper. We therefore developed a definition of complications compatible with CZS based on specific and non-specific characteristics for congenital Zika virus and TORCH infections observable up to the first week of life, adapted to the local medical capacities of our hospital. This classification might be more applicable in hospitals in low resource settings, often present in tropical regions, at risk of emergence and re-emergence of Zika virus. Thirdly, conclusions about the impact of the timing of infection on maternal-fetal transmission are difficult to establish as the diagnosis of maternal infection reported here may have occurred much later than the actual maternal infection. Thus, we could not assess the association between trimester of infection and outcomes. The recruitment of infected pregnant women occurred at the time of their first ultrasound scan performed at the prenatal diagnosis unit and was therefore not conducive to evaluation of early fetal consequences of maternal Zika virus infection before 12 weeks’ gestation. The rate of early miscarriages, some of them occurring in unrecognised pregnancies or at home without hospital consultation, is thus difficult to determine and was not the focus of our research. Furthermore, as we excluded pregnant patients for whom the diagnosis of Zika virus infection was done at delivery, because of the lack of specific follow-up during pregnancy and early postnatal life, our results cannot provide information on the consequences of late infection in pregnancy. Finally, our study aimed to describe the burden of congenital Zika virus infection in an epidemic population with a high birth rate and limited access to invasive testing. We cannot exclude the possibility that some of the signs observed were unrelated to congenital Zika virus infection; as illustrated by the population attributable fraction, a confirmed congenital Zika virus infection contributes to only 47% of adverse outcomes and 61% of severe adverse outcomes observed here. Some maternal information may have been missed, and invasive testing and complete genetic analyses were not systematically performed (for evident ethical reasons). Nevertheless, potential missing information or additional diagnoses not reported would result in an overestimation of the burden of congenital Zika virus infection observed in this cohort. Our study provides a large comprehensive description of maternal-fetal transmission rates of Zika virus, as well as the burden of congenital infection, during the recent Zika virus epidemic in French Guiana. Despite significant maternal-fetal transmission, the burden of disease seems to be lower than initially suspected and might not differ from those of other well know congenital infections. Although caution is needed, our results suggest that in cases of maternal Zika virus infection, approximately one in four fetuses will become congenitally infected, of which one in three will be affected by severe complications at birth or fetal loss. The population attributable fraction estimates that a confirmed congenital Zika virus infection contributes to 47% of adverse outcomes and 61% of severe adverse outcomes observed. This information will help healthcare providers conducting parental counselling. We thank all involved personnel at the Centre Hospitalier de l'Ouest Guyannais (CHOG). Contributors: LP, VL, CP, AJ, GC, MV, and DB conceived and designed the study. LP, VL, CP, GC, and NH provided care to mothers and prospectively collected the clinical data and samples. LP and CP collected data on neonatal outcomes. GM and GB, as fetal central nervous system experts, contributed to the interpretation of sonograms and the management of congenital Zika virus syndrome cases. DR and SM did all the viral investigations. AP, MV, and DB interpreted the results, did the literature review, and provided critical inputs to the paper. LP, MV, and DB wrote the first version of the report, and all authors critically reviewed and approved the final version. The corresponding author attests a similar contribution for LP and MV. The corresponding author attests that all listed authors meet authorship criteria and that no others meeting the criteria have been omitted. LP and DB are the guarantors. Ethical approval: The study protocol was approved by the institutional review board of the Centre Hospitalier de l'Ouest Guyannais (CHOG). Patients included in the study provided written informed consent after discussing the objectives of the study. Data sharing: Technical appendix and statistical code are available from the corresponding author at david.baud@chuv.ch. Transparency declaration: The corresponding author affirms that this manuscript is an honest, accurate, and transparent account of the study being reported; that no important aspects of the study have been omitted; and that any discrepancies from the study as planned (and, if relevant, registered) have been explained. Charrier R. Synthèse démographique de la Guyane - Une démographie toujours dynamique. 2017. https://www.insee.fr/fr/statistiques/2559184#titre-bloc-3. Agence régionale de santé. Surveillance du virus Zika aux Antilles Guyane. Point épidémiologique du 06 octobre 2016. 2016. http://invs.santepubliquefrance.fr/Publications-et-outils/Points-epidemiologiques/Tous-les-numeros/Antilles-Guyane/2016/Situation-epidemiologique-du-virus-Zika-aux-Antilles-Guyane.-Point-au-6-octobre-2016. Agence régionale de santé. Emergence du virus Zika aux Antilles Guyane. Point épidémiologique du 21 juillet 2016. 2016. http://invs.santepubliquefrance.fr/fr/Publications-et-outils/Points-epidemiologiques/Tous-les-numeros/Antilles-Guyane/2016/Situation-epidemiologique-du-virus-Zika-aux-Antilles-Guyane.-Point-au-21-juillet-2016. The Zika virus epidemic in French Guiana: proposition of an ultrasound based score for the diagnosis of fetal congenital Zika virus syndrome. Ultrasound Obstet Gynecol2017;50(Suppl 1):19.